Solid 925 sterling silver Stefana embellished with top quality Swarovski crystals supplied with its guarantee in a decorative Stefana box. To complement these stunning Stefana and complete the look are the Tray, Crystal Decanter and wine glass for the Church, and the Champagne flutes for the Toast. 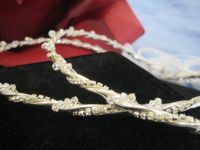 All the items are decorated with solid silver 925 and Swarovski crystals to match the Stefana.